Gyalse Shenpen Thaye was born in 1800 into the Gemang clan, in the Dzachukha region of Kham. 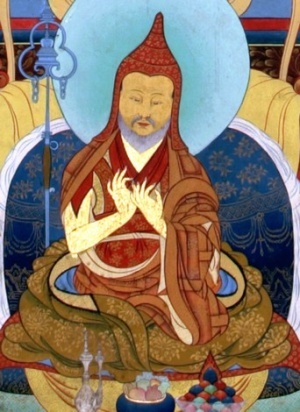 He was recognised as an incarnation of the great tertön, Minling Gyurme Dorje (Minling Terchen). He studied and practiced under many great Nyingma and Sarma masters, especially the First Dodrubchen Rinpoche, from whom he received teachings at Yarlung Pemakö. He also received transmissions from Jigme Gyalwa Nyugu; the Fourth Dzogchen Rinpoche, Mingyur Namkha Dorje; Sengtruk Pema Tashi; Minling Trichen and Minling Khen Rinpoche. He studied at both Dzogchen and Mindrolling Monasteries and, after having eliminated all doubts and misunderstanding through listening and reflection, he retreated to the mountains. He practiced in many sacred and solitary places from Mount Kailash in the West, to Mount Langchen Gying Ri in China in the East. In this way, he became a master with great accomplishments. As prophesised by his Lama, Dodrubchen Rinpoche, Shenpen Thaye settled for a while at the monastery of Palgyi Senge Mountain. There, he firmly established and spread both the Dharma of transmission and the Dharma of realisation. Many of his students, such as Dzogchen Khenchen Pema Dorje, committed themselves devotedly to the upholding of his lineage. When the First Dodrubchen Rinpoche passed into parinirvana, Gyalse Shenpen Thaye went to Yarlung Pemakö, where he served as his regent for several years. While there and with Patrül Rinpoche’s assistance, he initiated the tradition of an annual forty-five day teaching and practice of the Guhyagarbha-tantra. For the following two years, Patrül Rinpoche himself presided over these activities. In 1842, Gyalse Shenpen Thaye returned to Dzogchen Monastery after it had been almost totally destroyed in an earthquake. He restored the monastery and established the Shri Simha Shedra. Shri Simha Shedra rapidly became one of the most important centres for Nyingma studies. Many of the greatest nineteenth century Nyingma scholars and masters, such as Mipham Rinpoche and Patrül Rinpoche, studied and taught there for many years. Shenpen Thaye also demanded and established a very pure observance of the Vinaya code of discipline at Dzogchen monastery. Introducing the tradition of the annual rainy season retreats, as in the time of the Buddha, it became an example that was followed by many other Nyingma monasteries. Also the initiation of the annual practice of all the rituals, ceremonies and sacred dances of the thirteen Kama sadhana-cycles inspired many other Nyingma monasteries to follow suit. Fulfilling the wishes of Minling Trichen Rinpoche, he collected all Kama teachings of the Nyingma tradition and published them in one collection. Amongst his main disciples were Dzogchen Khenchen Pema Dorje, Patrül Rinpoche and Do Khyentse. Unfortunately there seems to be very few details regarding his life and his passing, only that he died quite young, and that his tulku was Gyakong Khenpo Chökyi Nangwa (1871-1927) of Dzogchen Monastery.